There are six Eva Longoria tattoos that are found on this exceptionally striking and petite brunette bombshell. This American actress is primarily known for her role as Gabrielle Solis on Desperate Housewives as well as being married to NBA guard tony Parker. Some of Eva Longoria tattoos first started drawing attention in 2008 when she landed the number 14 spot in FHM’s 100 Sexiest Women poll. Longoria’s original goals were to become a fashion model but due to her height, she decided to pursue acting. In 2000, she appeared on General Hospital and Beverly Hills 90210 which gave her enough recognition to be landed on the Young and the Restless. Today, Longoria and her tattoos have certainly became a popular household name. In fact, it was just announced in October 2010 that she will host the 2010 MTV Europe Awards in Madrid, Spain. Star – The first of the Eva Longoria tattoos is the tiny star that she wears on the inside of her left wrist. It has not been made clear the meaning behind this piece. Celtic Cross – One of the most photographed Eva Longoria tattoos due to her stunning drop back dresses she is always wearing on the red carpet is her Celtic cross on her lower back. It is small and simple and considering she grew up Roman Catholic, it is easy to see where her inspiration was found. Flower – Longoria wears a very small flower on her lower back off to the right side of her cross. It appears to be a tiny rose although the only pictures that can catch a glimpse are paparazzi photos from a distance. Roman Numerals – In 2008, photos emerged of a new addition to the collection of Eva Longoria tattoos. On the inside of her right wrist are the Roman numerals of July 7, 2007 which happens to be her wedding date. NINE – Longoria’s newest piece is the word NINE on her upper back, just below her neck. It is a tribute to husband Tony Parker. The number nine is what he wears on his San Antonio Spurs jersey. TP – The last of the Eva Longoria tattoos are the letters TP to stand for Tony Parker. Although no one has seen this tattoo, Longoria offers the information that it is tucked away nicely somewhere intimate where only Tony can see. Interesting TP is the name of Parker’s music album as he is also a musical artist in his spare time. Historically, religious tattoos were some of the first ones ever created. Even mummies that have been revealed from thousands of years ago with tattoos raise the question of if they were worn as a tribal symbol or as part of their religion. The ritual of receiving a tattoo and submitting to the pain was a way to connect spiritually with one’s religion. Even before organized religion became popular, widely recognized symbols displayed on tattoos were clearly meant to be representative of religion. It is obvious that they were intended to serve some type of purpose far beyond self-expression. Animal images and totems were used in many early religious tattoos to provide the wearer with protection, success for hunting and the power that was represented by that particular animal. These are tattoos with deep meaning that were meant to be much more than just decoration. Fast forwarding many years, the crusaders wore cross tattoos on their hand. This was to ensure that they would receive a Christian burial if they happened to be killed in foreign lands while they were at battle. Even believers of many different faiths wear religious tattoos representative of their personal beliefs to ensure proper burials according to their religion. • Christian – A recurring them with religious tattoos in Christianity is with the afterlife. For tribes such as the Maori, Sioux and Iban, tattoos served the purpose of being able to pass through to the afterlife. Tattoos could guarantee favor from various deities or could help those on a long journey find their way safely home. In addition to the crusader wearing cross tattoos, pilgrims who succeeded their travels to Jerusalem would often receive a tattoo so that they could show it off when they went home. It symbolized strong faith. See Celtic Tattoos. • Buddhist – It is suggested that Buddha himself was not a fan of religious tattoos however, Buddhism is quite rich with symbols such as the Buddha image, bodhi tree, lotus flower, dharma wheel and om. Buddhist monks actually work as tattooists during the March festival in Thailand. These religious tattoos bring strength and ward off injury to the wearer. • Jewish – Many Jews are strongly opposed to religious tattoos because they believe that you should not mark your skin. However, there are plenty of others of the Jewish faith that wear the Star of David. This is a symbol that represents the interaction between the moral and divine. • Hindu – There is a long history in this culture of tattooing. Traditionally, individuals receive a series of circles or lines on the cheeks, forehead and chest. Also, some temple girls in history would wear sacred symbols on their breast and shoulder to guarantee salvation of their souls. Celtic tattoos are the result of influences from various cultures that all work together to create one modern form. Celtic designs from thousands of years ago have become some of the world’s most popular tattoos. Christian priests invaded the country to convert the Celts after the Romans conquered Ireland. At this time, the Celts had no written language however, they were equipped with a visual style that was quite unique. It incorporated an attempt to suggest no beginning or end with their love for nature with complex and interlacing designs. The Christian priests borrowed this aesthetic style and fused it to decorate early bible manuscripts. As a result, Christianity took over the nation and Celtic tattoos had their genesis. It is unknown if the inspirations were used in the earliest tattoos but rebellious Celt warriors wearing ink were spoke of by Julius Caesar. Similar to the Picts who tattooed their warrior to offer intimidation, the Celts adopted this trademark. It was considered a very high honor to battle with the Celts. They were known for confronting their opponents either bare-chested or completely naked to reinforce an intimidation stance. They were also easily recognized by the way that they would dye their hair in bright colors from flower pastes and manipulate it into tall spikes around their head. To perform tattoos, the Celts used the woad plant, a hardy biennial native to the British Isles and Europe. Woad produces indigotin, the blue dye chemical that was used for tattoos. The leaves were harvested and then dried. Once they were completely dry they would be boiled and strained over and over again. The resulted paste was tapped into the warrior’s skin with some type of needle-like instrument that would force the stain under the top layers of skin, creating their design of choice. Quite often, Celtic tattoos were merely accenting impressive scars that were acquired in battle. These combined with the nakedness and startling hair created quite an intimidating sight. It is believed that Celtic symbols were some of the first cultural symbols in tattooing to appear on a flesh canvas. Celtic knots would appear on arms and the chest as well as many symbolic animals. 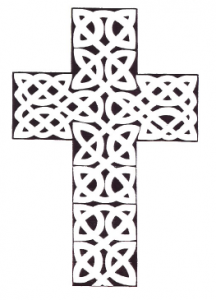 Celtic tattoos are some of the most intricately-detailed and difficult ones to complete. If you have the desire to get one, make sure that your tattooist has a substantial amount of experience in them and can offer a portfolio to evaluate.